A change, which is rolling out airline-by-airline but which officially begins to phase in this weekend on Aug. 15, will require that you hand over to the federal government more personal data than ever before in order to reserve a seat on a domestic flight. The overhauled Transportation Security Administration program is required by law, but many consumers haven’t heard much about it. That reasoning is a new TSA program called “Secure Flight,” which transfers the responsibility of pre-screening passengers from the airlines to the TSA. Secure Flight requires that airlines get your birthdate and gender so you can be prescreened agasinst a government watch list. “If consumers do not include this information, they may face delays at the airport, and our goal is to communicate and educate our customers across the board that this day is coming and they are going to have to add this additional information,” said Orbitz Vice-President of Governmental Affairs Brian Hoyt. Omar Jano and his mother Martha said that the TSA’s mistaken detention of Omar last year — because his name resembled one on the watch list — terrified their family. And Jano is not alone. Mistaken detentions have played out thousands of times; most famously perhaps with Massachusetts Sen. Ted Kennedy. He has been detained six times because his name is close to a suspected terrorist’s alias. Not everyone’s convinced that Secure Flight will improve the screening process. “It may make life a little harder, but I suspect that the people who are on the no-fly list aren’t giving their real names when they fly anyway,” said Chicago attorney Geerald Jenkins. Jenkins works with the Cyber Privacy Project, which says that making travelers hand over their birthdates is a step too far toward government control of travel. The right to travel is a constitutionally protected freedom, the Cyber Privacy Project says, which should not be encroached upon by the feds. “The government already has your name and they have the ability to search you. I’m not sure that adding birthdays and gender to that list of intrusions that the federal government already has creates any extra security,” Jenkins said. The Secure Flight changes will take place at the time tickets are booked, so if you’ve already scheduled a trip and weren’t asked for the new info, don’t worry. The TSA says airlines are phasing in their programs on an airline-by-airline schedule, though though neither TSA nor the airlines would share specific dates. 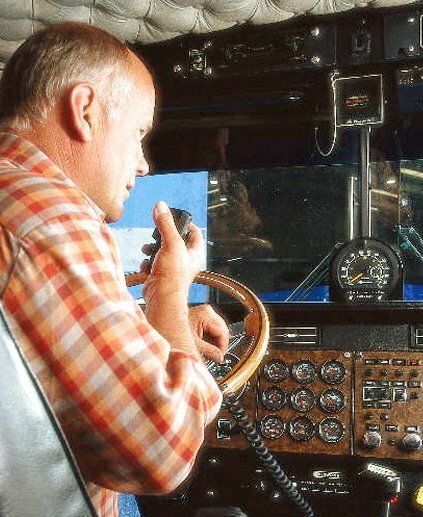 “Breaker, breaker 1-9..this TWIC card is giving me the cannonball runs…” – A dramatization of Trucker identity dissent.